PostgreSQL PHP Generator is a PostgreSQL GUI frontend that allows you to generate high-quality PHP scripts for the selected tables, views and queries for the further working with these objects through the web. With PostgreSQL PHP Generator you will have a very professional web database application ready for uploading to your website. 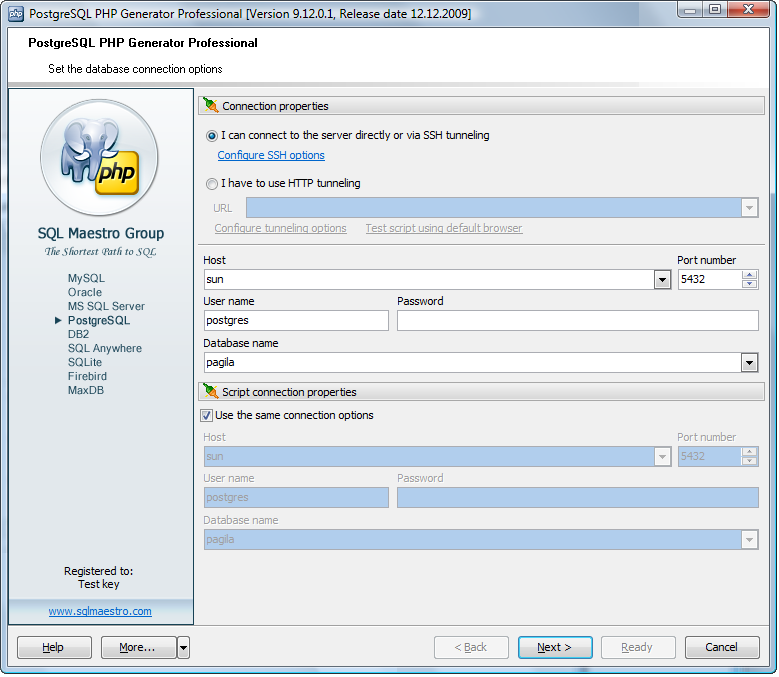 PostgreSQL PHP Generator is a high-quality GUI for building feature-rich PHP web apps. PostgreSQL PHP Generator - A Windows GUI utility for PostgreSQL PHP programming. * Data export to PDF, XML, CVS, Excel and Word. A Windows GUI utility for PostgreSQL PHP programming. Qweas is providing links to PostgreSQL PHP Generator Professional 10.3 as a courtesy, and makes no representations regarding PostgreSQL PHP Generator Professional or any other applications or any information related thereto. Any questions, complaints or claims regarding this application PostgreSQL PHP Generator Professional 10.3 must be directed to the appropriate software vendor. You may click the publisher link of PostgreSQL PHP Generator Professional on the top of this page to get more details about the vendor.